The Palace has an area of 120,000 sq.m (300m x 400m), surrounded by 4 main streets. This area has 3 floors, 2 mezzanines, 1 terrace, 1 ground floor, 1 basement and a rooftop terrace for helicopter landing. The total usable area is 20,000sq.m divided into 95 rooms, surrounded by lush tropical gardens. Each room has a different function; construction and decoration are suitable to the purpose of use of each room. After 1975, some rooms of this main building area continue to be used; the remainings are for serving tourists. The Reunification Palace is a unique architectural work by Architect NGO VIET THU. The construction was begun in 1962 and completed in 1966. Originally the site of the Nordom Palace also known as the Governor’s Palace its first role was as a home and workplace for the French Governor of Cochinchina. This place was the residence and working place of the President of the Republic of Vietnam. On 30th April in 1975 at 10:45 a Vietnamese Army Tank rammed the main gates and entered the palace grounds before hanging its flag on the balcony to declare victory for the communist party and thus ending the Vietnam War. Nowadays, The Reunification Palace is a popular Historical Relic in Ho Chi Minh City and visited by many foreign and domestic tourists. This place has also been used for the Government’s meetings and receptions.. 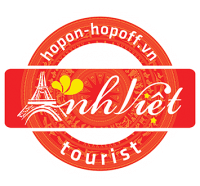 Recently, Hop on – Hop off tour develops in Vietnam market, Anh Viet Tourist had a meeting to introduce this new product in HCMC. With this product, travelers have the opportunity to go through the famous places in Ho Chi Minh City is easy and convenient, but prices are reasonable. Why not go now?